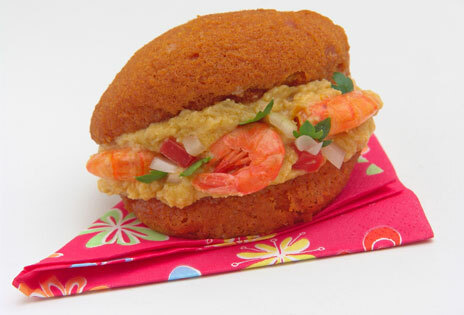 The food from Brazil is just as interesting and diverse as the people and landscape of this thriving melting pot. There has been heavy influence from the various immigrants to the country as well as the indigenous population. This post will focus on the heavy Moorish influence on Brazilian cuisine coming from an interesting mix of Portugal, African slaves, and Arab immigrants. Portugal at the time of the colonization of Brazil was a nation recovering from a lengthy period of Moorish occupation. Many of the colonist were Christianized Moors, or moriscos. Also, a little known fact is that Brazil has the largest Arab population outside of the Middle East. The Moorish influenced remained in Portuguese culture as evident in the cuisine and language. Many Portuguese words have Arabic roots such as orange (laranja in Portuguese; from the Arabic naranj نارنج) and rice (arroz in Portuguese; from the Arabic al-ruzz). Both rice and oranges were brought to Spain and Portugal by the Moors. The Arab influence is so deeply embedded in to Brazilian culture that most do not realize how prevalent it is. It has just been integrated as Brazilian. In the main Brazilian cities it is easy to find restaurants that cook Arabic food such as sfihas (Portuguese esfirra), tabbouleh (Portuguese tabule), kibbeh (Portuguese quibe), hummus, tahina and halwa are very well known among Brazilians. Brazilian mainstays such as cuscuz arrived via African slaves. Cuscuz is a popular dish in Bahia, Brasil. Couscous is actually the national dish of Morocco. The term Cuscuz, also spelled cuscus and cuzcuz in Portuguese, refers to several preparations in different regions of the country. The origin of the plate is certainly the Middle Eastern couscous, but once it was introduced to the new tropical culture, several versions using local ingredients began to develop. In Bahia, Brasil Cuscuz can be a plain, steamed, cake-like cereal made with flocos de milho pré-cozidos (yellow, precooked corn meal - “Milharina”, by Quaker, is a very well known brand). Usually served for breakfast, it’s made in the cuscuzeira, or cuscuzeiro (see picture), a steaming pan that has a perforated metal disc with a handle that seats on top of simmering water where you place the corn meal, previously moistened with salt water. 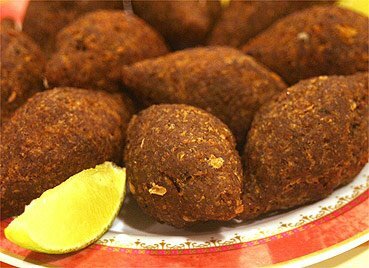 Kibe/Quibe: extremely popular, it corresponds to the Lebanese dish kibbeh and was brought to mainstream Brazilian culture by Syrian and Lebanese immigrants. It can be served baked, fried, or raw. It is stuffed with meat or hummus. Esfiha (Arabic: sfiha): another Middle Eastern dish, despite being a more recent addition to Brazilian cuisine they are nowadays easily found everywhere, specially in Northeastern, Southern and Southeastern regions. 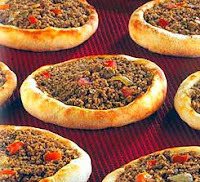 They are pie/cakes with fillings like beef, mutton, cheese curd, or seasoned vegetables. 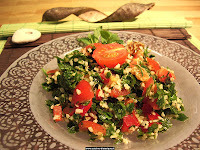 Tabouli is another fixture at salad bars. 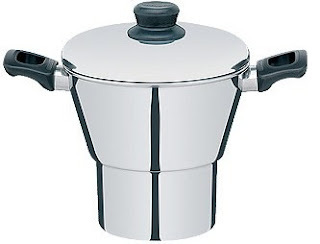 The African hand in the Brazilian cooking pot completes the triptych, most noticeably in the northeastern states, where the plantation system held greatest sway. There, from virtually the inception of colonization, Africans were in control of the kitchens of the Big Houses. 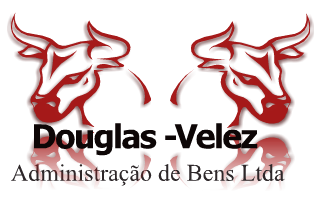 In Bahia, Brasil they were from the Bight of Benin and the Sudanese regions of West Africa. In Rio and Pernambuco, they were mainly Bantu. All brought their own tastes in food. 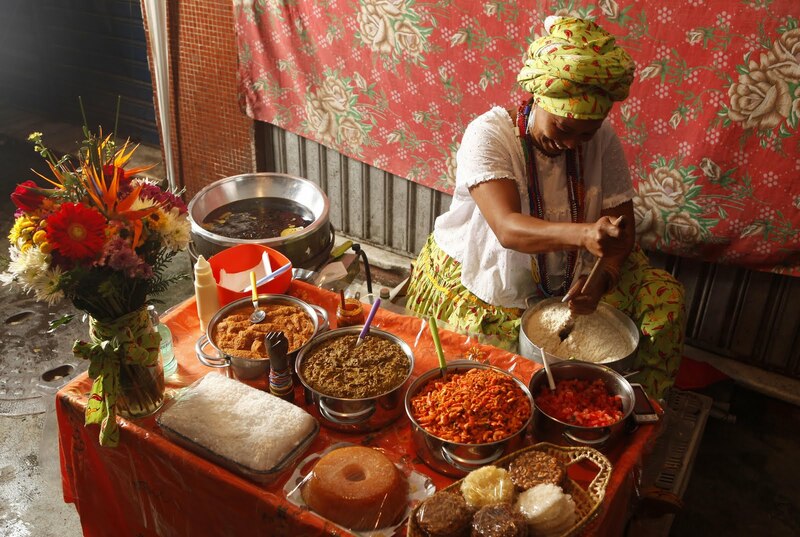 The religious traditions of the African continent crossed the Atlantic as well, and in the hands of the Big House cooks, many ritual dishes were secularized and joined the culinary repertoire. The akara, a bean fritter fried in palm oil by the Yoruba people of southwestern Nigeria, was transformed into the Brazilian black-eyed pea fritter, or acaraje; fon akassa changed only its spelling to become the acaca, and the Angolan cornmeal porridge known as funji kept its name and its spelling as the dishes of the African continent were turned into Brazilian standbys. African cooks embellished dishes with ginger, chilies, and pulverized cashew nuts and maintained the tastes of coastal Africa in the continued use of dried smoked shrimp and palm oil. They adapted recipes and adopted the ingredients of the new land to create a cooking so unique that the food of the state of Bahia is considered by many the linchpin that connects the cooking of Africa with that of the Western Hemisphere. 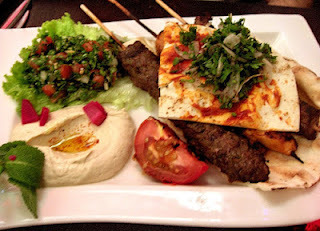 cuisines, both carrying deep Arab influences, there is a difference. kitchen was further re-enforced by the dishes of West Africa and the Middle East. Brazilian cooks have been borrowing from the foods of other people, then combining them with their own to produce an interesting and fascinating wide-ranging culinary world. Above all, it was the Portuguese influence, itself greatly influenced by the Arabs, which was the main influence in the creation of Brazilian cooking. When the Arabs conquered Portugal, they brought with them numerous new dishes: they needed ingredients to create these foods, and introduced a considerable number of vegetables, fruits and spices, unheard of in the Iberian Peninsula at that time. Many have still retained their Arab names in Portugal. Orchards, first planted by the descendants of the Arab soldiers, cover the land. The perfume defusing flowers of the apricot Portuguese albricoguo from the Arabic al-barquq; carob (alfarroba: al-kharubah); orange (laranja; naranj); and pomegranate (romá: rumman) were Moorish gifts to the future Portuguese. Besides the fruit trees, other plants brought to the Iberian Peninsula are, perhaps, more important. Rice (Portuguese arroz: from the Arabic al-ruzz), forming the basic part of the Portuguese diet, and sugar cane (açúcar: sukkar), now cultivated in Algarve, the last province wrestled from the Moors, were introduced and grown extensively by the Arabs. Over and above the new plants they introduced into Spain and Portugal, the Arabs expanded the almond, olive and fig orchards that they found in these countries. The blossoming almond trees initially planted by the Arabs on a large scale, transform Algarve's springtime countryside which looks like a snow-covered field. However, even more than the introduction of plants, the water mill (Portuguese azenha: from the Arabic al-saniyah) and its extensive use in irrigation was the greatest gift the Arabs bestowed on Portugal and the other countries of Western Europe. The rich fields of fruits and vegetables found in the Iberian Peninsula since the 9th century bears witness to the Moorish introduced plants and farming techniques. This is attested to by the 12th century Arab writer Abu ‘Abdallah al-Idrisi who described Algarve as a land of beautiful cities surrounded by irrigated orchards and gardens. The Arab introduced plants made possible a series of new culinary delights, expanding greatly the kitchen of the Iberian Peninsula. In Portuguese, Arabic derived names for foods are an undeniable testimony to the influence the Moors had on the cuisine in this part of Europe. 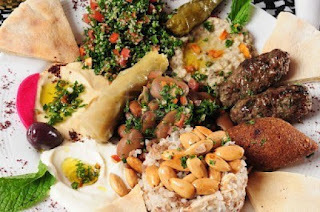 Acepipe (hors d'oeuvres: from the Arabic al-Zebib); aletria (vermicelli: itriyah); almôndega (meat balls: al-bunduqah) ; escabeche (pickles: al-skabaj); azeite (olive oil: al-zayt); sorvete (sherbet: sharbat); and xarope (syrup: sharab) are a number of these foods. 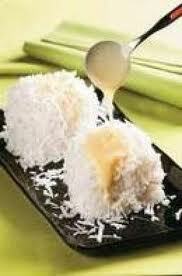 More than all their dishes, the Moors had a fondness for sweets and passed on this sweet tooth to the Portuguese. Candied fruits and pastries employing almonds, egg yolks, honey and rosewater, found today in all parts of Portugal, are all of pure Moorish origin. Perhaps the credit for their preservation should go to the nuns in the many religious institutions, found in every town and city. No one knows the reason why the nuns, in the numerous medieval convents, kept the Arab recipes for sweets alive. In the days of the Arabs, lamb and goat, along with some beef, were the basic meats on the everyday menu. However, when the Muslims were defeated, pork became the main meat. To escape persecution and prove they had left their former religion behind, the Christianized Moors substituted pork for other meats, especially in the public eating-places. All these culinary contributions the Arabs gave Portugal were later to be brought to Brazil. 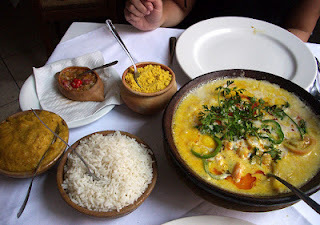 This historical base of Brazilian cuisine with its Arab connection was further buttressed in the last hundred years by the large immigration from the area of Greater Syria to all parts of that land of the Amazon. 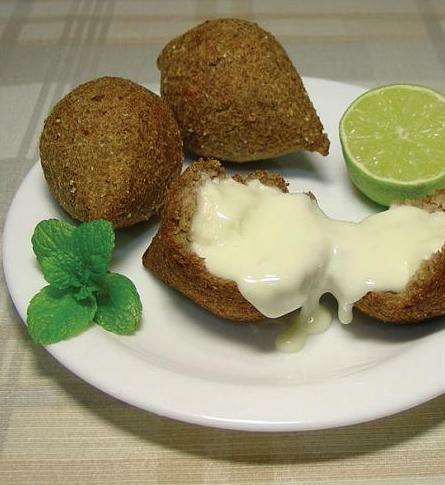 Today, in every large Brazilian town, the eastern Arab delights of sfeehah (open meat pies), taboulah (parsley salad) and, above all, kubbah (burghul and meat patties known in Brazil as kibe), are offered in many homes and public eating-places. The first time I entered a restaurant in Recife, Brazil's major north-eastern resort, I was astonished to see featured on the menu kibe - a delicious dish whose original home is the Middle East. In the ensuing days I discovered that this famous Middle Eastern dish had become a Brazilian food. Served in a great number eating places throughout the country, it was prepared in a much tastier fashion than its land of origin. The Arab inherited portion of the Brazilian cuisine is considerable. Both through the Moors, by way of the Iberian Peninsula, and the Arab immigrants of the 20th century, the kitchen of Brazil has been greatly enriched. Travellers from the Arab world need not pine for their foods. In this land of the Amazon, they will find a kindred cuisine. Your article about Brazilian Food is really awesome. Thanks for sharing your experience with us. We are Brazilian Portuguese family and we like Brazilian food very much. I have tried many Brazilian recipes which i got from youtube and many other website. 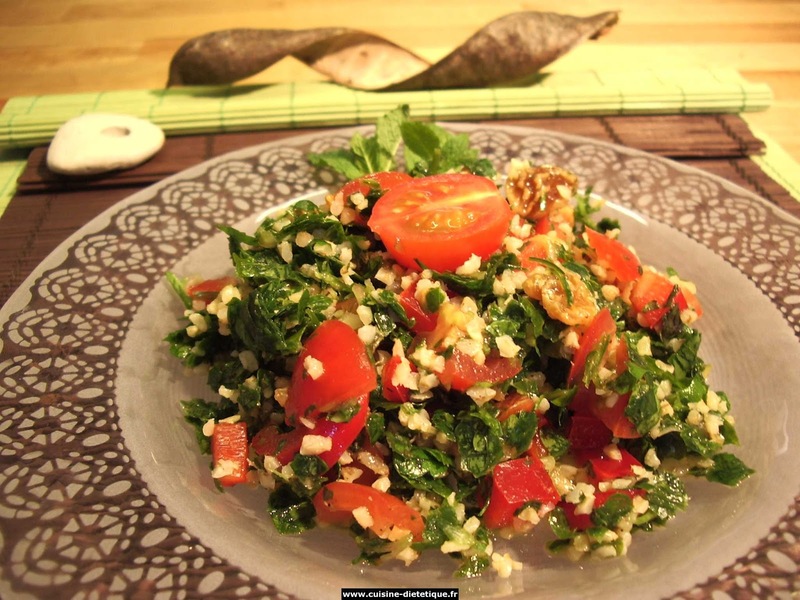 i would add that teh Taboule, Sefeha and Hommos are mainly Lebanese Cuisine.